Noswaith dda/good evening from Brisbane. I'm writing this post especially for Laura, Happy Homemaker UK. She is kindly hosting an expat party today. 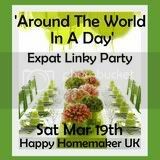 She's invited any expat blogger to share something about their host country. So hello to Laura's friends. If this is your first time here, welcome. Here is a bit of my world. I moved from Wales via rural North Yorkshire to live in Brisbane a few years ago. I am constantly fascinated by the wildlife here in Australia and love taking photos of the local creatures. ...warning, some are prettier than others! the first live snake I ever saw! but it's something that I have very quickly adapted to! We are just beginning to see the start of Autumn here in the Southern hemisphere, so I'll be seeking out the long sleeve t-shirts and we'll be swapping shorts for longer trousers soon. So why don't you head on over to Laura's and join the party? and each with a story to tell. wow, if I came across that snake I'd be terrified - it looks quite long! 2 good friends of mine moved to Australia and they told me its practically normal to have them around! I must say that I am happy to be living in Tassie and therefore not having to live with those pesky cane toads. They are really unappealing!! I'm always shocked by the wildlife photos coming from there - it never fits my impression of that area of the world :) Love the beach photo with your daughter(?) in colorful clothing - this could be in a magazine. Stopped over from Around the World in a Day hop. Have a great Sunday! 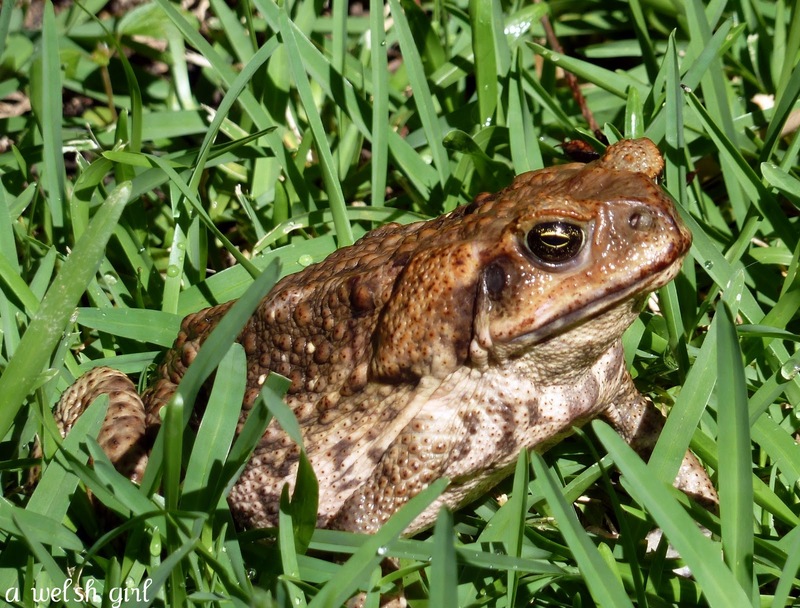 Good post, and that cane toad, it's ugly and big and yet I couldn't stop staring at it, again, for a few seconds. I'm not a big fan of toads...or frogs...or rabbits....they hop so quick and I never know which way they will go...but still, fascinating to look at! The photo of your daughter on the beach, sigh...winter on a beach without the coats, scarfs and Uggs...Enjoy it honey! Ugh, cane toads! I've never even seen a cane toad, they don't (or didn't) have them anywhere that I've lived in Oz and despite trying to see one in Brisbane I never did. Hopefully I'll get to Wales later this year, I kind of imagine the mountainous areas are a bit like Cumbria. 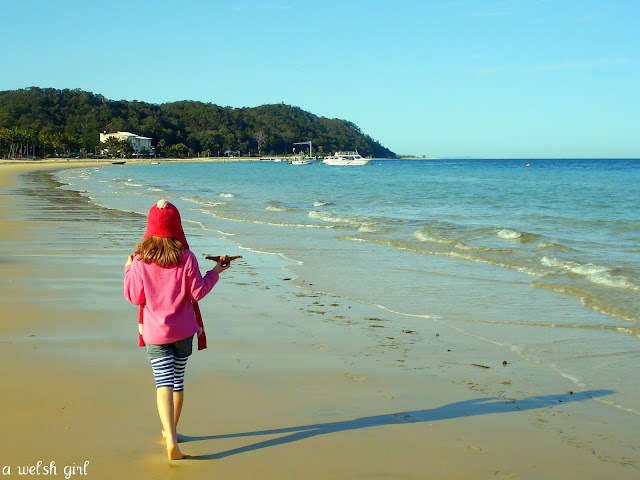 Your photos are stunning - the one of your daughter on the beach is a fantastic shot. Beth it's the Kiwis that say pents - not the Aussies! Or the ones I know. Oh another cane toad shot. I can hardly bare it. We have a plague in our suburb, and you see baby toads jumping about all over... it's an epidemic of huge proportions, and terrifies me to think there will be that many large toads about. Apparently it's due to the weather and there being so many puddles. Interesting read! I have some similarites, being an Englishman in Florida. Some of the local wildlife, alligators, armadillos, snakes, etc seems dangerous and exotic to me, but always fascinating. Actually the armadillos aren't dangerous. I love your toad photo! We don't have a great deal of amphibians and reptiles compared to other places, I've realised!